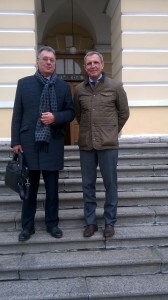 On April 25, 2017 at the St Petersburg State Chemical-Pharmaceutical Academy the International Round Table “ScanBalt Bio Region: New opportunities for members of the St Petersburg Cluster of medical and pharmaceutical industry to find partners in the BSR” was held as part of the VII All-Russian Scientific Conference of Students and Postgraduates «YOUNG PHARMACY – POTENTIAL OF THE FUTURE. ScanBalt Chairman Jaanus Pikani and ScanBalt General Secretary Peter Frank made presentations at the Round Table and other speakers were the SPCPA partners Prof. E. Savontaus, University of Turku, Prof. R. Leino, Abo Academy University and Dr. F. Molnar, University of Eastern Finland. The Round Table was attended by numerous representatives of the St Petersburg pharmaceutical companies, medical officials, researchers, students and Ph.D students from medical Universities. The participants were invited to meet with potential partners from the ScanBalt Business Club meaning mainly companies within biotechnology, pharmaceutical industry, medical equipment and service providers. Business to business meetings will be organized during the ScanBalt Business Club B2B Days at SPCPA on June 6-7,2017. The 6th of June likewise the board of ScanBalt will meet at SPCPA. During the visit to St Petersburg the ScanBalt delegation also met with representatives of the St Petersburg Administration in Smolny.